This is the new home of TrekJews.com, an eclectic nexus for articles, links, and other stuff related to Judaism and Star Trek, maintained by Rabbi Yonassan Gershom, author of -- you guessed it -- "Jewish Themes in Star Trek"! 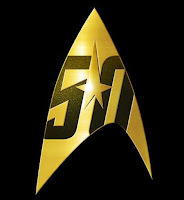 Today is the 50th anniversary of the airing of the first episode of Star Trek. Lake every other Trekkie in the planet (and maybe beyond), I find myself looking back at how the show affected me during those first years. "This was back when most Jewish actors and writers changed their names to sound more “American.” The hero was always a Stoic White Man of the Aryan Persuasion who never, ever waved his hands around or spoke with a Yiddish accent like the people on my block. Even biblical characters were played as if they grew up in the American Bible Belt. Everybody celebrated Christmas on programs like “Leave it to Beaver,” but there was no acknowledgement of Hanukkah, except maybe to morph it into a “Jewish Christmas,” complete with a bogus “Hanukkah bush.” If Jews were included in the script at all, they were usually played as buffoons." Of course Spock wasn't Jewish, but Leonard Nimoy was. And he was no buffoon. It is well documented that Nimoy drew upon his Jewish background to develop the character. We all know about the Vulcan Salute being derived from a Jewish blessing gesture, but there are other influences also. His love of knowledge and pride in his Vulcan culture were important to me at a time when intellectuals were disparaged as "eggheads" (forerunner of "nerds") and being Jewish was something we often hid in order to "pass" in a world hostile to us. I credit Spock with giving me a model for how to live in an "alien" world without losing my identity as a Jew. It was not until my mid-50s, when I was diagnosed with ADHD and later autism, that I found another reason I relate to Spock. He does indeed have a lot of seemingly autistic traits, even though Roddenberry thought of them as "logic." Then again, many autistics are good at math and logic. And like Spock, we often misread human emotions. All of this, of course, is my own personal transference. Others see Spock in different ways. Which is fine. Star Trek has always been a mirror in which we see ourselves reflected. That is a big part of its longevity. May it continue to do so for many years to come. All blog posts are © copyrighted to Yonassan Gershom. Comments belong to their authors. Please feel free to link to my articles and quote short passages, but DO NOT mirror them on other sites. Thank you. The old website went down, but we are not out! Visit often as we reconstruct and improve the site! Star Trek XI: A Vulcan Holocaust?